We are very excited to announce that our first homeowners at Travino Square began moving in last week! This stunning building is a major source of pride for our team and our homeowners. Travino Square is simply a beautiful place to live. 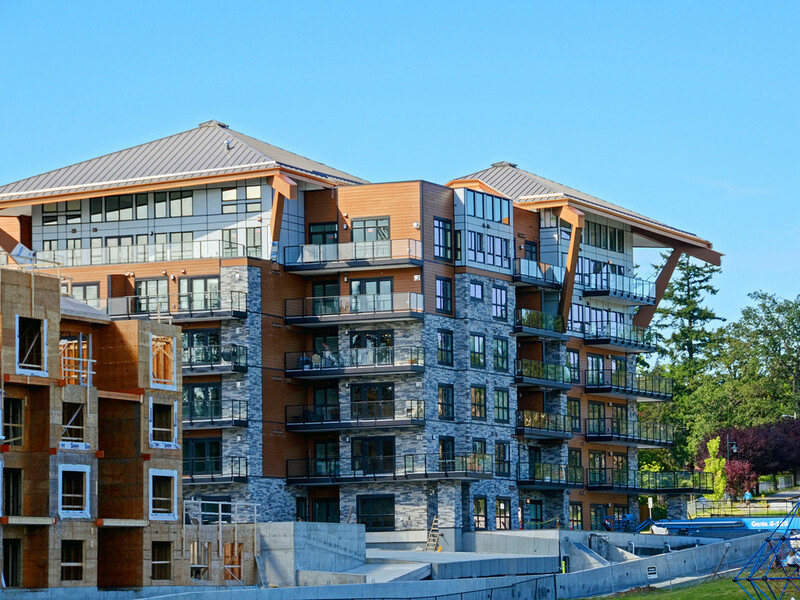 It’s well-designed, energy efficient and healthy living spaces are connected to the incredible views and green space that surround the Travino community with oversized balconies and the rooftop patio! It’s also the first wood-frame building on Vancouver Island to include advanced soundproofing technology that has been tested to ensure its effectiveness. The results are in and Travino Square’s floor and ceiling construction outperforms the soundproofing in concrete buildings! We have chosen to invest in this innovative technology so that Travino homeowners can enjoy living in their new spaces in the utmost comfort and enjoy the peace of mind that goes along with investing in a quality home. There are still some final touches on the inside and out being completed on Travino Square and our happy homeowners will continue moving in over the days ahead. Travino Landing is well underway and on schedule for completion early next year. Framing is now finished and work has begun on the roof. Windows, doors and exterior finishes are scheduled for delivery and we will begin installation soon. This beautiful 4-storey building is tucked away in a quiet corner of Travino and will have all of the high-quality features that we’ve included in Travino Square as well as a bird’s eye view of our future water features, gazebo and walking trails. Travino Square and Landing are completely sold out, however we’re getting close to the sales launch and ground breaking for the final building in this award winning community, Travino Gardens. We can’t wait to tell you more about this spectacular building so stay tuned via our newsletter and social media channels for updates.